Athens boasts a wide range of hotels close to Plaka or Monastiraki, residences in the center, youth hostels at the foot of the Acropolis and, indeed, there are hotels of the major hotel chains next to the Eleftherios Venizelos international airport. Instead, the B&B supply of Athens is not so large, but the 2 or 3 star hotels offer the same services as B&B. 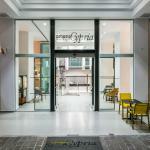 Hotels of Athens city center and luxury hotels in Glyfada: the hotels next to Syntagma Square (Constitution Square), in the center of Athens, are among the most prestigious, often housed in period buildings. Other interesting and lively central areas, where to book a hotel, are the Omonia Square and the Plaka and Monastiraki districts. One of the most expensive districts to stay is definitely Glyfada, which together with Ellinikò forms part of the Athens waterfront, where there are the most renowned shops and restaurants, and also the best 4 and 5 star of the Greek capital, equipped with the most modern comfort. Cheap hotels and residences in Athens: for those who have a limited budget or simply want to economize, all year, there are special offers and opportunities to stay in cheap hotels and hostels in Athens, although it is always advisable to book in advance. At the foot of the Acropolis are in fact many economical solutions, exactly in the neighborhoods of Plaka and Monastiraki. Those who prefer to book an apartment in Athens, can find suitable housing solutions for families or groups of friends with equipped kitchen for less than 100 euros per night. Athens residences are both in the city center and in the suburbs. 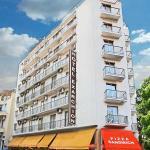 Well located in the picturesque Plaka district, next to Monastiraki metro station, the Athens Center Square boasts chic, modern accommodation with free Wi-Fi and a breathtaking view of the Acropolis. 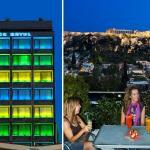 The Carolina Hotel is located near the Plaka area of Athens near the Acropolis and the National Gardens. Thanks to its great location you will have easy access to all areas of interest of the city. 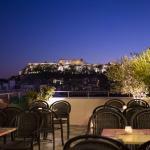 The Exarchion Hotel enjoys one of the liveliest areas of the city of Athens. 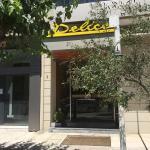 Within walking distance there are the National Archeological Museum, Syntagma Square and Monastiraki flea market. 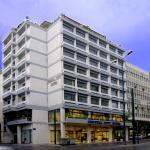 Hotel Solomou is located near Omonia Square in Athens. Close by are the underground and the National Archaeological Museum. The elegant rooms have a private bathroom and panoramic balcony.